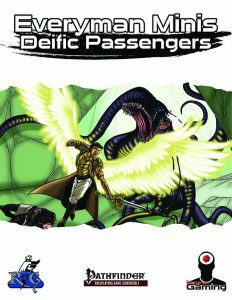 All righty, first things first: You need Paranormal Adventures to use this pdf. The content herein represents an expansion for the Vessel class – think of these guys basically as the equivalent of the Demons and Angels from the Supernatural TV Series, with more control for the person hosting them. The class basically represents beings that are possessed by so-called passengers. A big and intentional hole in the portfolio of the class, at least as far as I’m concerned, is addressed herein. The original vessel class does not have an option to be possessed by a deity as a passenger spirit – considering the diverging levels of omniscience/omnipotence of deities throughout different campaign settings, this makes sense: Direct involvement in the realms of mortals may break a core tenet of your campaign…or, if you’re favoring less powerful divinities that take direct action, it may just be what you wanted. The alignment of a deity passenger (passenger “statblocks”, i.e. their presentation, is btw. explained) must match that of the vessel (deities are picky) and they are associated with all of the domains of the deity in question. That *can* be problematic in very low-powered games– deities provide more associated domains than the default 3 that regular passengers offer, representing an upgrade regarding flexibility when choosing the Omen that grants access to one; since omens may not be taken multiple times unless otherwise noted, you can’t just gain domain upon domain, though – you just have a broader selection available, so yeah, this gets a pass in most contexts. The DR is bypassed by the opposed alignment – as a minor complaint, the rules do not specify whether only one alignment axis is relevant here or both: There do exist a couple of DRs that require two axes to bypass. I assume that’s not the case here, but yeah. Grace boon-wise, the deity passenger gets divine resilience at 3rd level, gaining resistances depending on the deity’s alignment (one is chosen; two more are gained at 6th level and 12th increases one to 10, with level 15 increasing the others to 10 as well); we also gain a +1 bonus to saving throws versus specific effects based on the chosen domain, which increases by +1 at 6th level and every 3 levels thereafter, capping at +5 at 15th level. Almost a whole page is devoted to listing these by domain and the benefits cover a wide breadth of options: Luck, for example, grants the bonus to saves versus curses and hexes; magic fortifies versus spells, SPs and effects generated by dragons and magical beasts, travel helps versus teleportation and effects that cause Strength damage and also applies to CMD versus being involuntarily moved…honestly, this is impressive. Considering that the bonus is pretty much a vanilla, passive ability, it is rather impressive to note the creative applications here. Kudos! 6th level nets domain as a bonus omen – and no, if you have it already, you don’t get two. 12th level, however, does indeed grant a second domain, including that domain’s divine resilience bonus. Also at 6th level, when using grace to cast domain spells, CL and DC are increased by +1, which upgrades to +2 at 15th level. 9th level yields Believer’s Boon as a bonus feat, using grace to activate it. 15th level provides reliable passenger’s jaunt to plane shift to the deity’s plane and may carry additional targets with him sans additional grace expenditure. 18th level provides outsider apotheosis as well as the option to cast 6th level or lower cleric spells by spending half the spell’s level in grace and expending a vessel spell slot of the spell’s level. Editing and formatting are top-notch, I noticed no hiccups. Layout adheres to Everyman gaming’s nice two-column standard with a white background – it is, thus, printer-friendly. The artwork in full-color is neat and the pdf has no bookmarks, but needs none at this length. I was very happy that the deity option was not included in Paranormal Adventures. It has serious ramifications on the way in which a game world’s cosmology and logic works. That being said, I am just as happy that Matt Morris provided this wide-open, yet surprisingly well-balanced optional expansion in this Everyman Mini. This little pdf actually inspired me far more than I expected when I double-clicked on it to open it. After I had read the brief write-up, a whole campaign had taken shape in my mind: Picture a world, where the divine war threatened to tear asunder the fabric of creation. Faced with mutually assured annihilation and very much limited in potency and knowledge, the deities agreed on having their pawns, mortal godkings and leaders fight on their behalf, channeling them, seeking to establish dominance sans destroying all of reality. Thus rose nations, empires, under the guidance of divine lords, with dynasties of vessels groomed for rulership…but what when one empire’s the deity chooses another? What when ALL deities forsaken their dynasties in favor of new blood? How will the established rulers react when upstarts with a divine mandate arise and armies clash?? When the war of propaganda and intrigue boils, fighting for the souls of nations? I’m sorry. I was somewhat spirited away there, but more so than the vessel class previously managed to do, this passenger and its interaction with the base-class actually inspired me! This is a prime example of the amazing things that can be done with small minis, a prime example of a great idea, contained in a deceptively brief, incredibly concise little file. This is glorious – not for all campaigns due to the effects on cosmology…but I can count the times I was this inspired by such a small pdf on one hand. This is excellence. 5 stars + seal of approval. You can get this inspiring expansion for the vessel here on OBS! Missed Paranormal Adventures? You can get the book here on OBS!